We love pizza — all types of pizza — so we almost always have lots of pizza toppings in the house. A couple weeks ago, I decided to mix things up a bit. 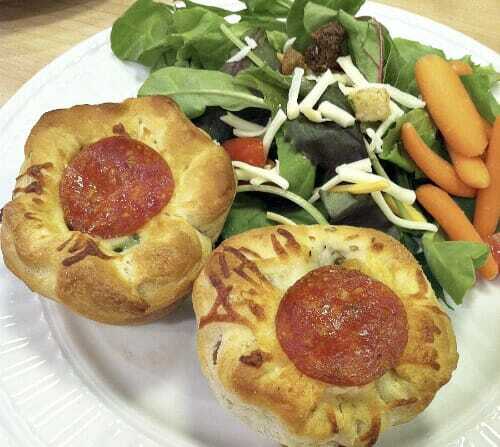 Instead of making homemade pizza or doctoring up a frozen pizza, I tried making muffin tin pizzas. The only “problem” was all the recipes I found online called for pizza dough as the crust… and I didn’t have pizza dough or the time to make pizza dough. So, I improvised using a package of refrigerated biscuits — and it worked marvelously! Not only did these taste delicious, they were so easy to make. I literally had dinner on the table in about 25 minutes — and I didn’t even have a recipe to follow or know exactly what I was doing. There’s probably less than 10 minutes of hands-on time involved in this recipe, and I have a feeling your kids would love to help! The ingredients can be as simple or as complex as you like. I just used whatever we had in the fridge — so feel free to customize them to your family’s tastes. I served our pizzas with a simple side salad and a few raw veggies. That’s it — so simple. Oh, and if you love pizza as much as we do, here are a few other recipes you might want to try. Made these the other night and they were delicious! Tonight I tried it with left over pot roast. It was so good! Thanks for the idea! yay! thanks for sharing! Also, the pot roast does sound amazing! Just made these for dinner. Everybody loved them. thanks for sharing Becky — so yummy and delicious! 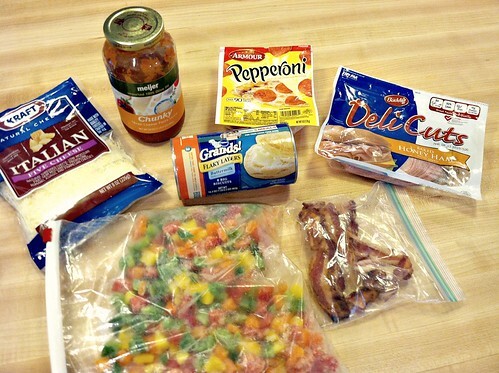 Some more ideas for quick pizza are to use Flour Tortillas (any flavor), Flatbread or English Muffins. I have 3 boys ages 16 , 14 and 9. This is something thatis great for them to make as a snack anytime as they are constantly eating! We usually make our own whole wheat pizza dough, BUT I LOVE to make the Bubble Up Pizza recipe from Pampered Chef sometimes. You take a can of biscuits and cut them in quarters in a greased dish, then add a jar of pizza sauce and whatever else you want (ham, peppers, onions, whatever…..and cheese, always cheese). Use your hands to mix it all up. i imagine a kid would love to do this part. Mine’s still too little. You can top with more cheese if you want. Bake at 350. I don’t remember how long, maybe 20-30 min. Watch for it to bubble up. It’s like a deep dish pizza, but you have to use a fork. Soooo good. A co-worker gave me a recipe years ago that is great, simple and easy, and uses a can of buttermilk biscuits as the dough. Essentially you spread out the biscuits on a cookies sheet sprayed w/ cooking spray (you want them to be as thick as a normal pizza – I can usually do 4 on a cookie sheet) and make little pizzas, top with sauce, cheese and whatever toppings. Bake at 375 for 10-15min until golden. Delicious and easy! And since a tube has 8 biscuits, it’s dinner for us and our son, and lunch the next day! this looks Perfect! for my little (4 year old) cook helper!! We will try it this weekend!!! This is a great idea for breakfast pizza. I love pizza and I love simple! I will be trying this one. Have you ever tried Trader Joe’s pizza crust? I used to make home made until I discovered TJ’s. It’s about $1.25 for the dough ready to bake (comes in a bag). I have even stocked up on it and put it in the freezer – it thaws out and bakes just fine. 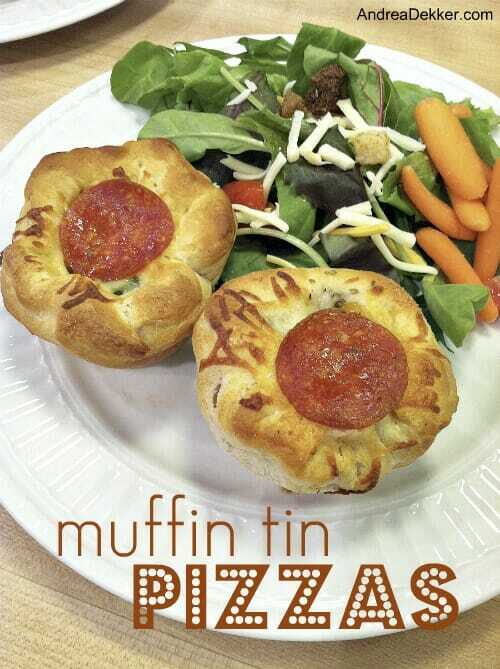 I love the idea of making mini pizzas in the muffin tins & using actual muffins is so clever (and quick!). We had something similar for supper last night! It was beef, corn, BBQ sauce onions and cheese all in a biscuit. I also do little chicken pot pies this way. Great for leftover meat. I am sooo going to have to try this. Then I can customize it for the girls!!! !